OVA that came with the PlayStation 2 game "School Days L×H"
Makoto, Sekai, Kotonoha, and many other classmates all go to a hot springs hotel to relax, where they discuss what their plans are for the upcoming Valentine's Day. When the day actually comes, half a dozen girls fight over who gets to give chocolate to Makoto. well this was a OK OVA about the main series school days. you have 3 girls who like the main character and one overly helpful mom and one crazy little girl. this was certainly a little different than the theme of the main story(they kept the knifes). the story is pretty much about girls giving chocolates to mokoto for valentines day. if you liked the series you should watch this. I still say that the art and sound is good each given 7. So, now basically, they made this anime much more funnier and more enjoyable than compared to the anime itself. I love it when Makoto gets tortured by girls who gave him chocolate. Like the another OVA of title, "Magical Heart Kokoro-chan", this is comedy. Unlike it, this isn't funny. You can say, "plot isn't so stupid and childish like MHKC, so why it's should be worse?" Because seeming seriousness completely ruins all its attempts to be funny, while the stupidity (the real one, not flashy as in MHKC) doesn't let to perceive it like a sensible story. In the end there is my favourite tune of title name inserted (no other word for this), which is the keynote, the summary of the original series, the expression of all the mood, all the characters hopes and aspirations... And it makes no sense, since OVA has no hopes, no aspirations, no mood but the silliest one. The bottom line — Valentine Days is filler episode outside a series. It's not clear what this been done for, but if you've been so attached to the characters that any parting makes you suffer, this would fit as another dose... But how long can you stand it? I feel kind of obligated to give a small explanation about this OVA since it seems nobody else did it before. This OVA isn't part of the main series and although it's the same setting and the same characters, this Episode wouldn't fit into the main story at all. You could say this is kind of an alternative to the story or maybe a nightmare that Makoto Itou is having? The nightmare thingy might be the best explanation to it since his conscious might feel guilty. All in all, this wasn't as funny, it was just creepy and a little awkward and the purpose to it is, that it's just a little (bad) extra for the School Days Fans. 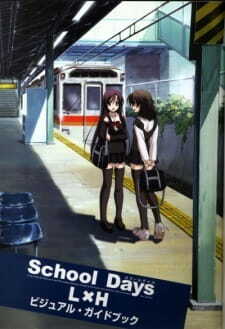 If you're not as obsessed with School Days and didn't like the main story as much, don't waste your time on this. - Otome bullies Kotonoha Katsura, so why would she even invite Otome to the hot spring? Even given that this might be after they all went to the pool, why would Otome be part of it? Well, the OVA has its flaws... maybe a little too many of them and you might find even more when you dig enough through the story. Can I show this to people who haven't seen the series?